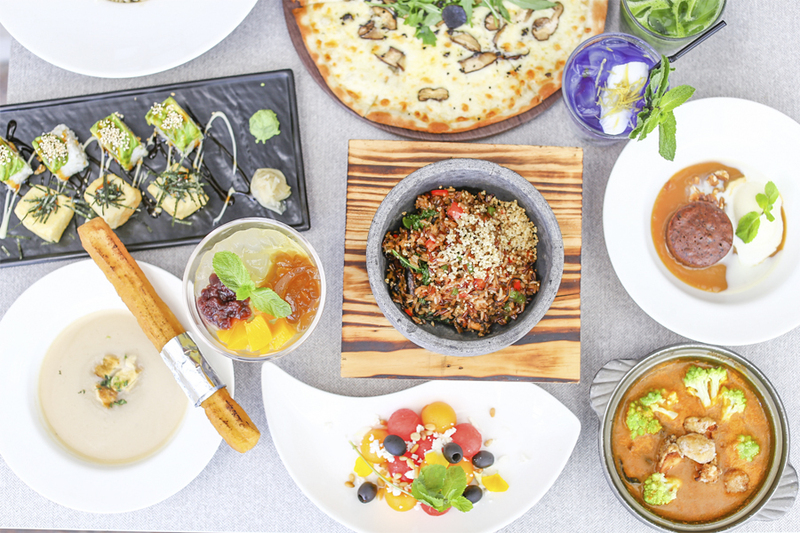 Friends and readers have asked me frequently for vegetarian restaurant recommendations, though they may have certain impressions about vegetarian food – that it can be plain, super healthy-tasting (ie not delicious enough) or just full of mock meat. 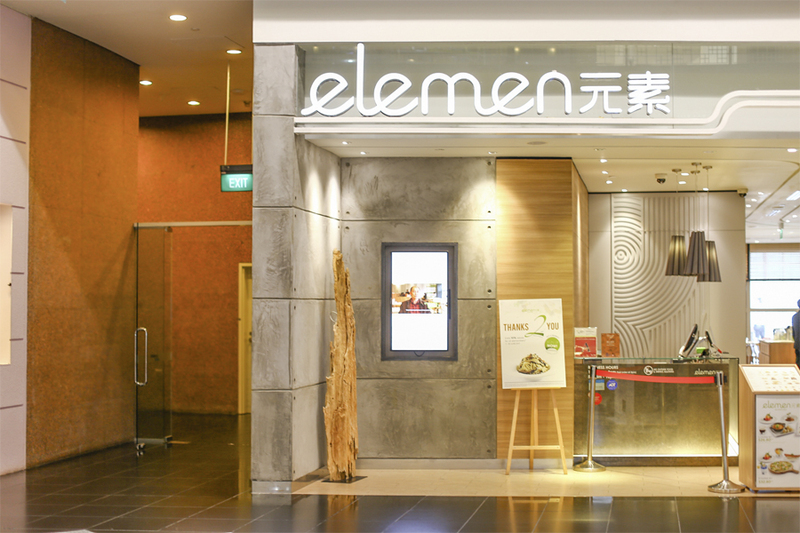 Elemen 元素, located at both Millenia Walk and Thomson Plaza, could just change that perception. 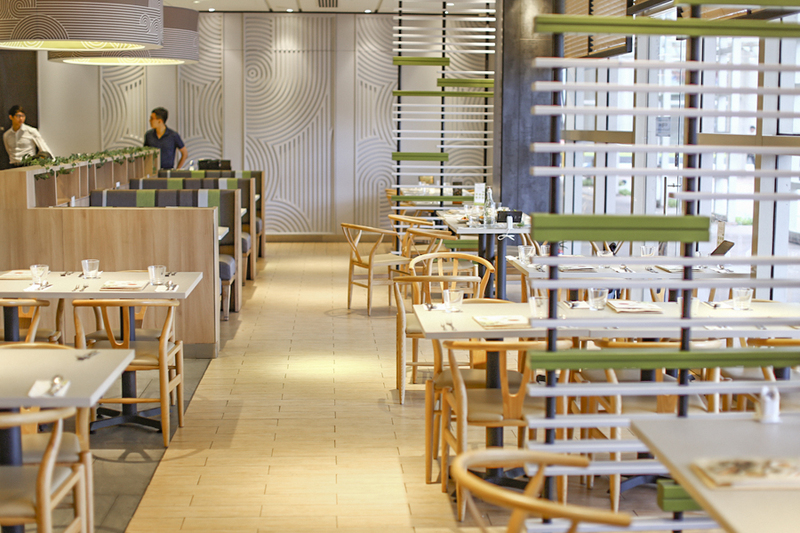 The outlet at Thomson Plaza has been quite popular with families as well. 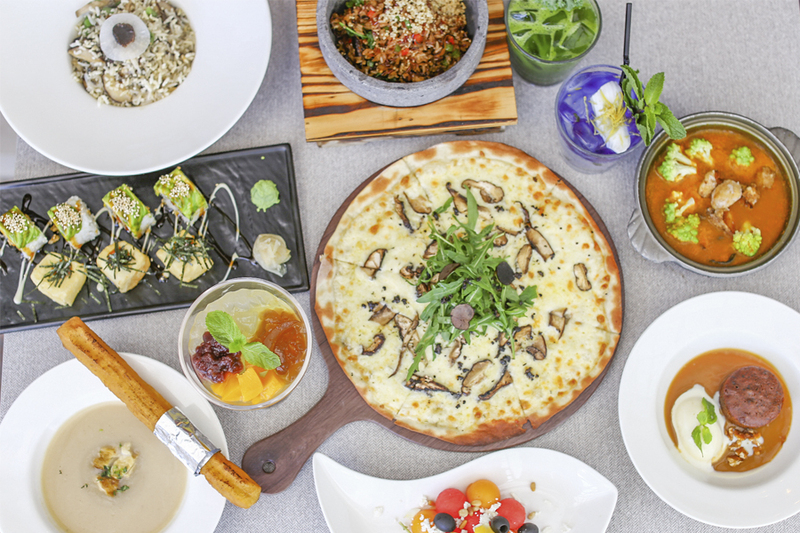 The inventive menu may just surprise you, offering a Western and Asia dishes, some incorporating both styles to deliver dishes that are both appetising and presentable. There is no use of mock meat in the entire menu. What you can expect include pasta (Black Truffle Porcini Pasta), pizzas (Milano Pizza), noodles (Braised Bailing Mushroom with Ee Fu Noodles), salads (Quinoa Salad), soups (Double Boiled Mac, Soup, Wild Mushroom Cream Soup with Truffle Oil) and desserts (Five Treasures Ai-Yu, Snow Chrysanthemum with Grass Jelly), creatively incorporating vegetables and mushrooms in place of meat. 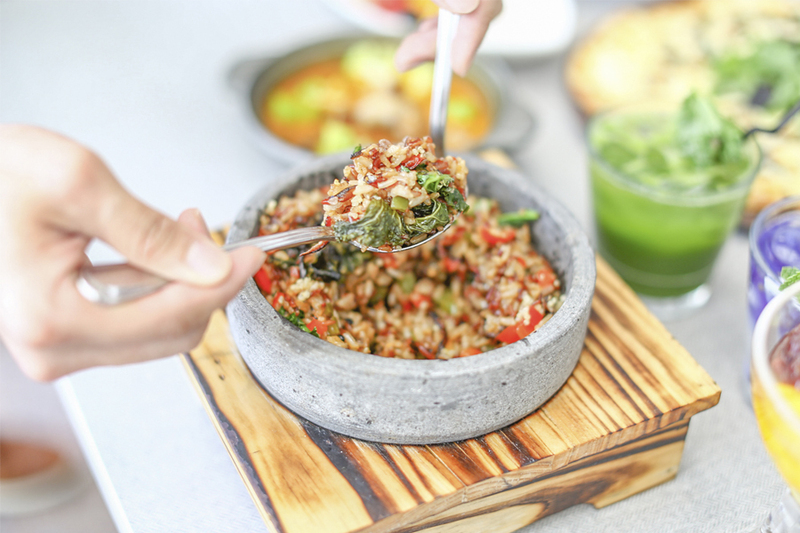 The sizzling sound of the heated stone bowl, and the aroma of the nutty brown rice arrived before the dish itself. Easily one of my favourites here, for it reminded me of my comforting claypot rice. Except this contained two superfoods of brown rice and quinoa at the same time. The rice had a slight char for the crisp, mixed with bell peppers and soft sliced mushrooms. The winning part was the savoury, slight spicy sauce coating every grain. There are two pizzas served at Elemen. 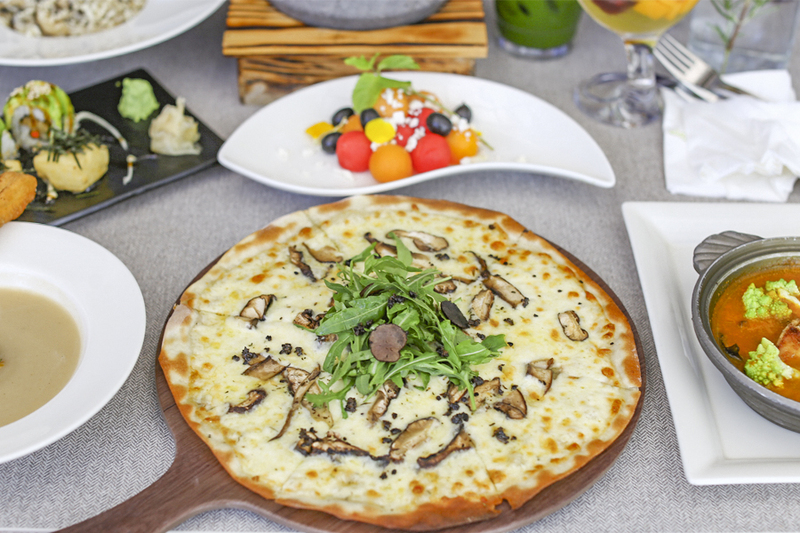 The newly-introduced Milano Pizza ($15.80) topped with special mushroom paste, crispy monkey-head mushroom, red reddish and vene cress. 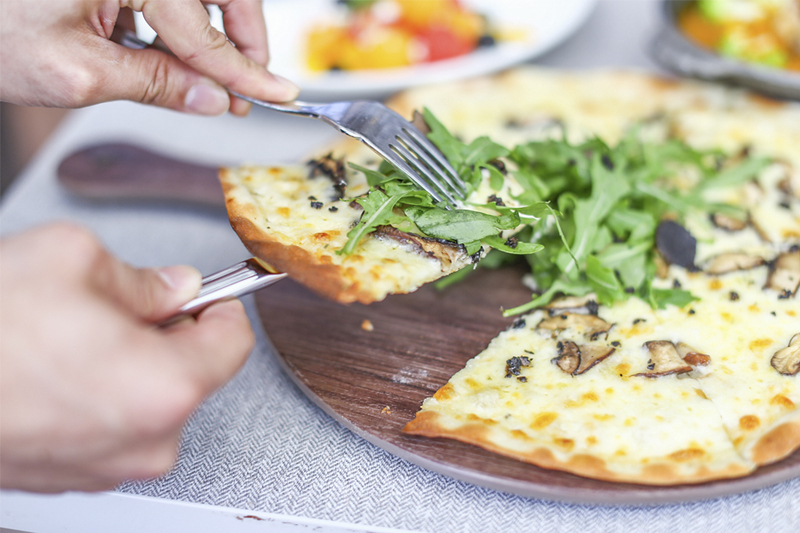 I can imagine that the Wild Mushroom and White Truffle Pizza will be a crowd favourite, combining scent of truffle oil, agreeable texture of thin-crust pizza, and taste of a rich-creamy sauce on its base with sautéed wild mushrooms. 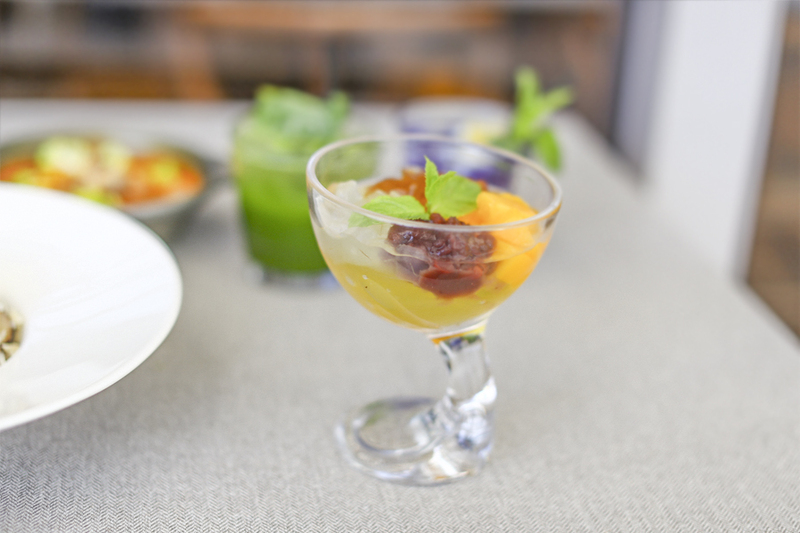 This dish was newly introduced because many vegetarian diners were fans of curry, and therefore requested for one. Customers’ request which turned into a reality. This mild, not-too-spicy curry is different from the typical ones, improvised with nyonya recipes, cooked with monkey-head mushroom and romanesco broccoli. 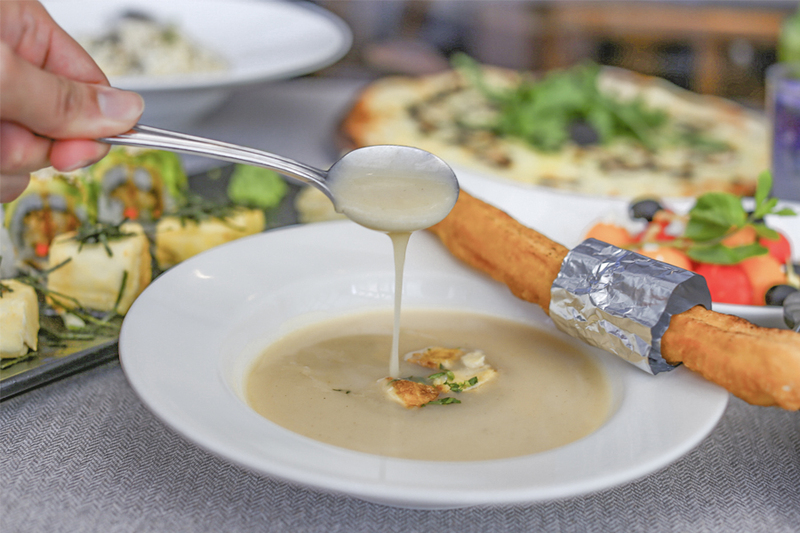 Even though the gravy featured coconut milk, the overall taste was not too heavy or jelak. 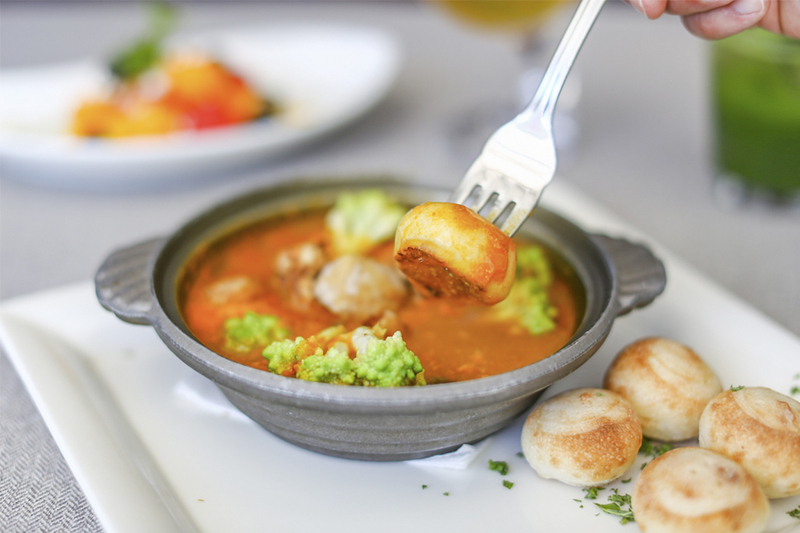 Instead of the usual toast or baguette, the kitchen team came up with these in-house baked cheese dough balls for dips. A fun, chewy touch. 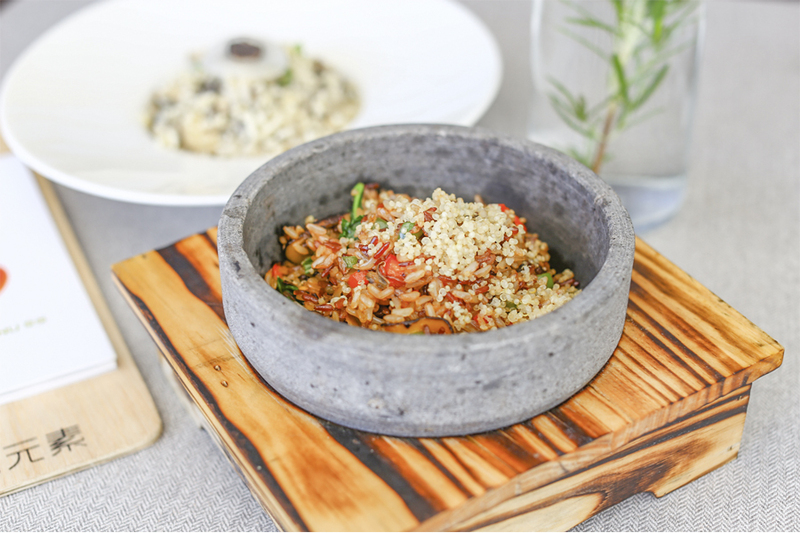 While I was more used to the usual Italian styles of risotto which are creamy and cheesy, Elemen’s Mushroom Risotto has a light-handed take and goes easy on the palate. I was more indifferent towards this version. 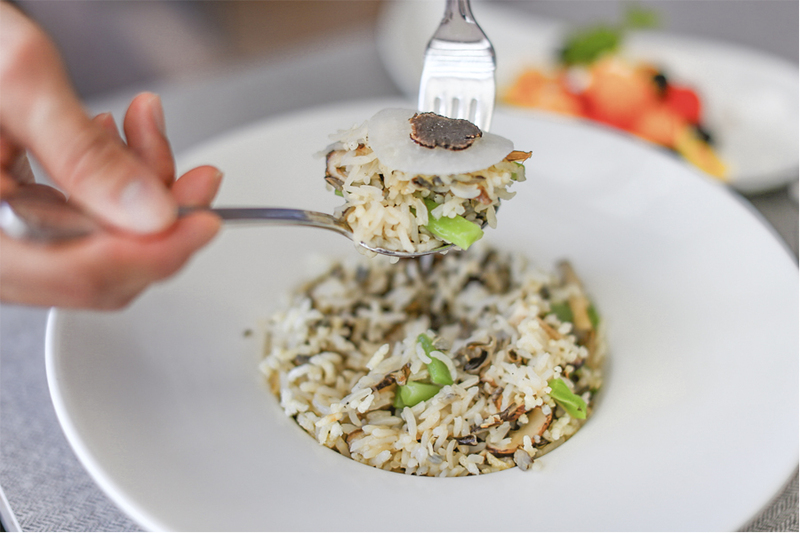 Using a mixture of wild rice, short grain rice and crispy rice which provided a variety of textures, interesting to note that this Risotto is Chinese wok-fried, and thus has some wok-hei. 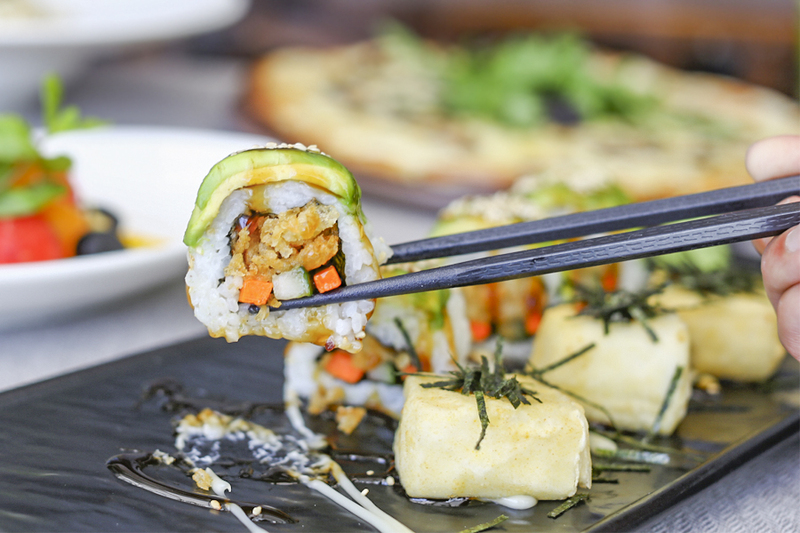 This merges two favourite Japanese dishes together – an avocado sushi roll and tempura tofu similar to agedashi tofu. 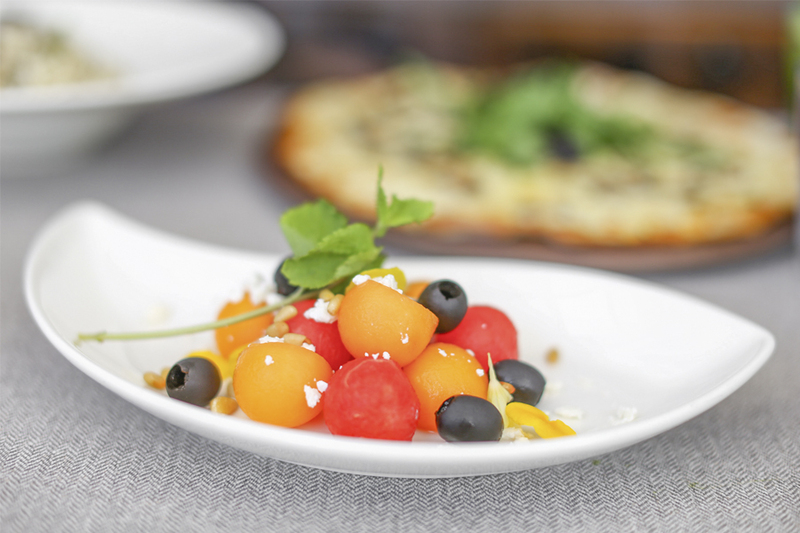 While fruits are typically served as an after-meal dish, this is a starter salad, beautifully-coloured with compressed watermelon, feta cheese, rock melon, mint and toasted pine nuts which provide a mixture of textures. I usually choose the cream-based soups anyway. I liked that there was something else other than mushroom cream soup, in this case a herbal cream soup flavoured with white pepper, cinnamon and star anise. A faint boot of spice every mouthful. 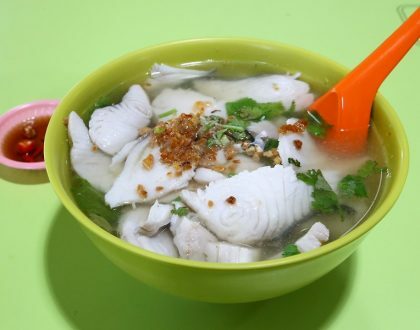 Who can resist dips into the soup with crispy youtiao aka dough fritter? 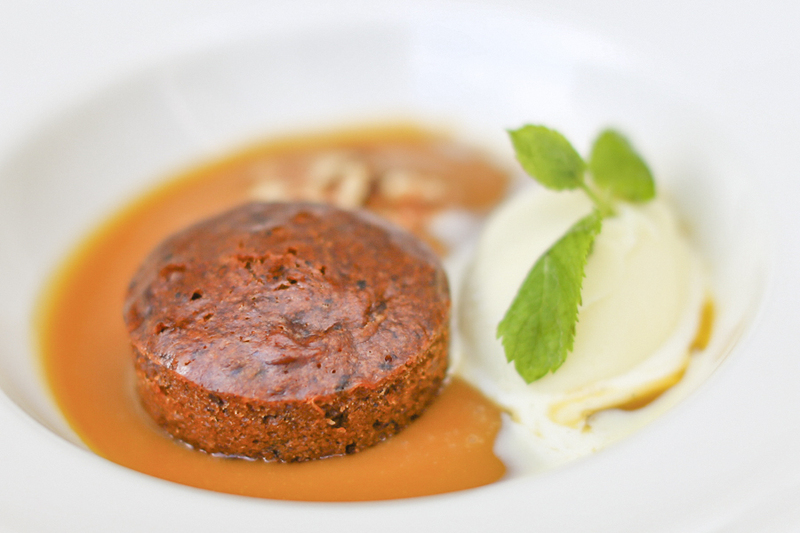 Warm pudding contrasted with cold vanilla gelato, glazed in homemade butterscotch, sprinkled with walnuts. 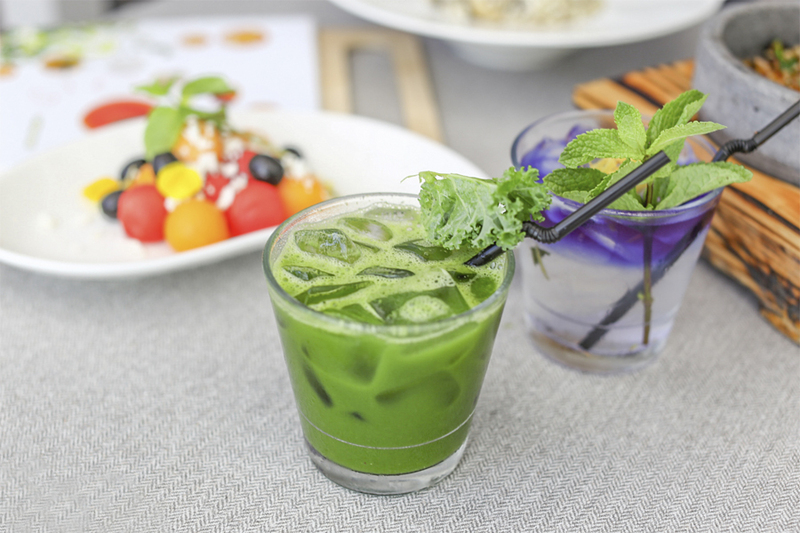 The perfect healthy “perk me up” drink. 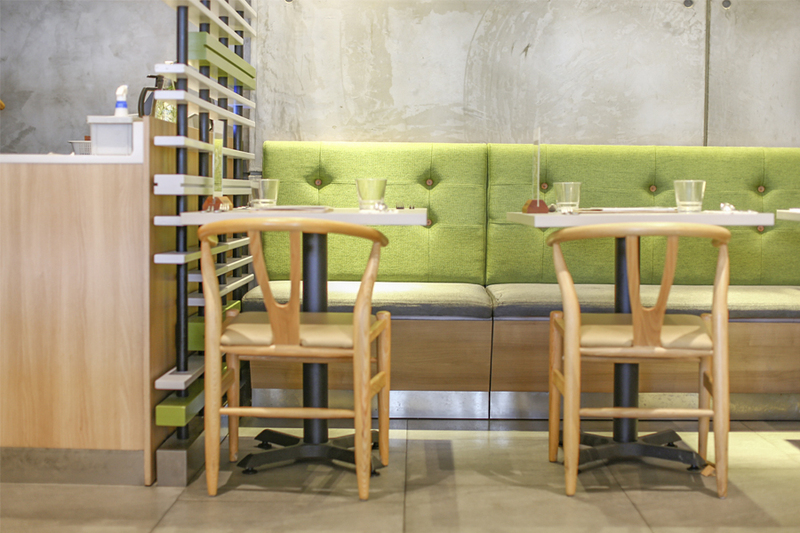 Couldn’t imagine at first I would use “instagrammable” in a vegetarian restaurant writeup, but here it is. 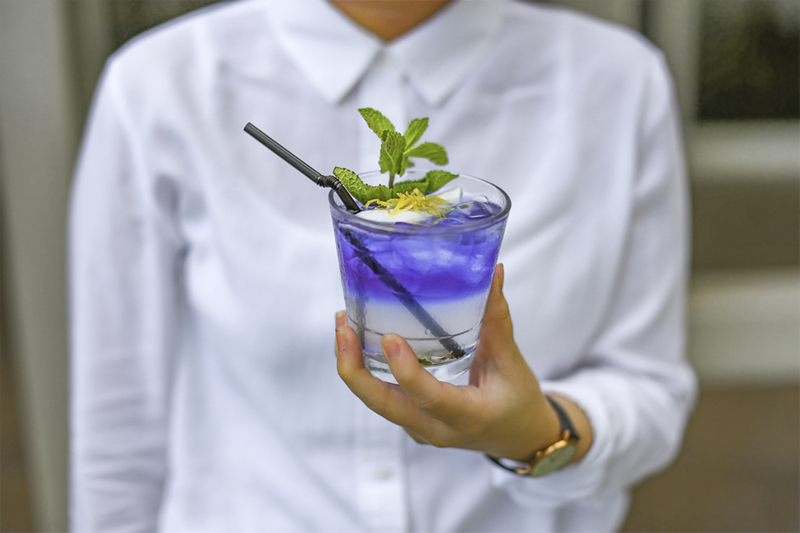 A purple-to-blue color-changing drink stunning to look at, full of antioxidants, refreshing after a satisfying meal. 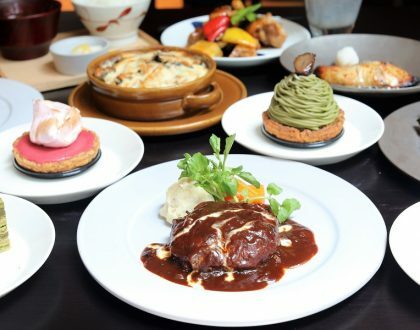 For time-starved corporate executives, Elemen has also rolled up wallet-friendly 5-course and 8-course meals ($26.80++ and $32.80++ respectively). 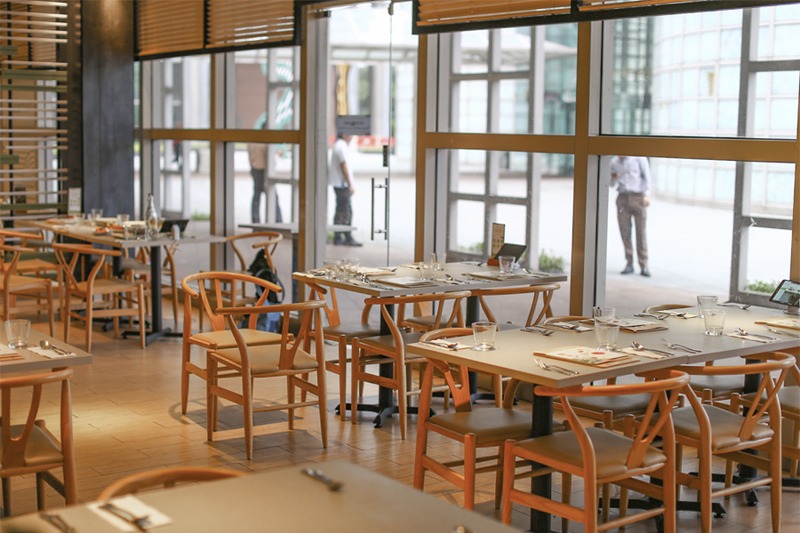 Available during weekday lunches and dinners (except Fri night), the menu changes quarterly. 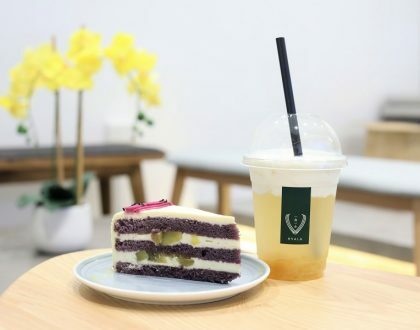 What you get is a starter, salad or soup, main, dessert and beverage – which include Coconut Chocolate, Sea Salt Coffee , and iced Lychee Green Tea. 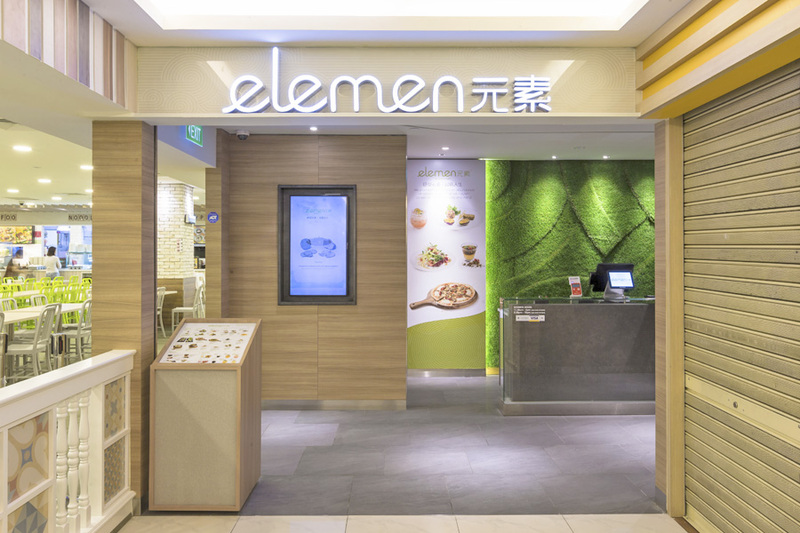 I find that Elemen is not only for the vegetarians, vegans and health-conscious, meat-lovers like could find many dishes both surprising and wholesome. * This entry is brought to you in partnership with Elemen.